In January 2009, Apple announced that all songs on the iTunes Store would soon be sold without the DRM restrictions that had been part of the company’s music downloads since the store’s inception in 2003. The iTunes Store will begin offering eight million of its 10 million songs in Apple’s DRM-free format, iTunes Plus, today with the remaining two million songs offered in iTunes Plus by the end of March. So I was somewhat surprised the other day when I downloaded Spin’s free “20 Years of Lollapalooza” compilation from the iTunes Store, and found that two of the 20 tracks were 128-kbps, FairPlay-saddled files instead of modern 256-kbps, DRM-free files. DRM on a new iTunes Store download? Say it ain't so! 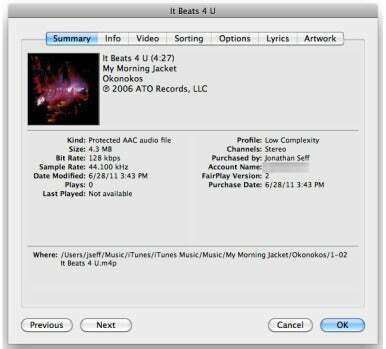 The dead giveaway was when I noticed both My Morning Jacket’s “It Beats 4 U” and Company of Thieves’ “Death of Communication” listed the Kind as “Protected AAC audio file” instead of “Purchased AAC audio file”. Interestingly, when I searched the iTunes Store for "It Beats 4 U" I got no results. When I looked up the album Okonokos that the song comes from, I found that it’s now listed as “It Beats for You”, and is one second shorter than the previous version. With “Death of Communication” I was able to find the song on the iTunes Store (again with a slightly different run time) but not on the same album. My download lists the album as Death of Communication - Single, which doesn’t appear anywhere on the iTunes Store. Is this a reversal of Apple’s stated DRM-free policy, or just some kind of quirky loophole Apple keeps open for those who want to give away free songs on iTunes? I attempted to contact Apple for clarification, but had not heard back at the time this story was published. Either way, it’s been a long time since I’ve seen a new DRMed track appear in my iTunes library.